One of the most entertaining party bands that can be booked in Crawley. This traditional jazz band in Crawley wears striped blazers and straw boaters. To book this Crawley jazz band follow this link. Acoustic Jass's New Orleans Jazz style means that the classic jazz tunes have a beginning a middle and an end, and are great for concerts, dancing or just as background music anywhere in Crawley. 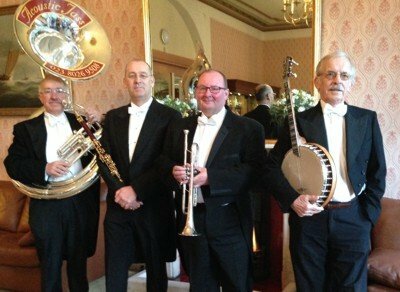 Like all acoustic wedding bands for hire in Crawley they can play exciting party music indoors and outdoors and can move between as required. This jazz quartet was has performed at venues large and small in Crawley and has been hired to provided music entertainment for all sizes of audiences from lunch and dinner parties of thirty people, to corporate events with up to seven hundred and fifty people (they did use PA there). This classic jazz ensemble once performed for a party of six people in their front room. Visit their gigs page so that you can see if they are available in Crawley on the the date you would like to book them or, to see where you can come and hear this jazz quartet. Visit their gigs done page to find out where else in Crawley these experienced professional jazz musicians have played. One of the best Jazz Bands playing in Crawley.